With property values on the rise, land and vacant lots in South Miami can be a great opportunity to build a new construction home or invest for the future. Because there are usually few, if any, vacant lots for sale in South Miami, most land opportunities in South Miami are older "tear down" homes well suited for new construction. Whether you are a savvy investor or first time buyer looking for that special opportunity, The Forster Team can help you find the best deals on land in South Miami. 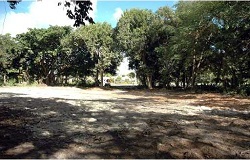 Vacant Lot For Sale Near South Miami Hospital.